Mol. Cells. Mar 31, 2019; 42(3): 218-227. Mol. Cells.Mar 31, 2019; 42(3): 218-227. Received April 11, 2018; Accepted October 15, 2018. (A) qRT-PCR was performed to detect relative PVT1 expression in AAA tissues and normal abdominal aortic tissues. Each circle and block represents an individual subject. n=20 for each group. **P < 0.01 vs. normal group. 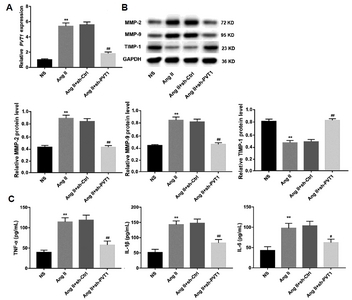 (B) Male ApoE−/− mice were infused with Ang II (1000 ng/kg/min) for 28 days to induce AAA. 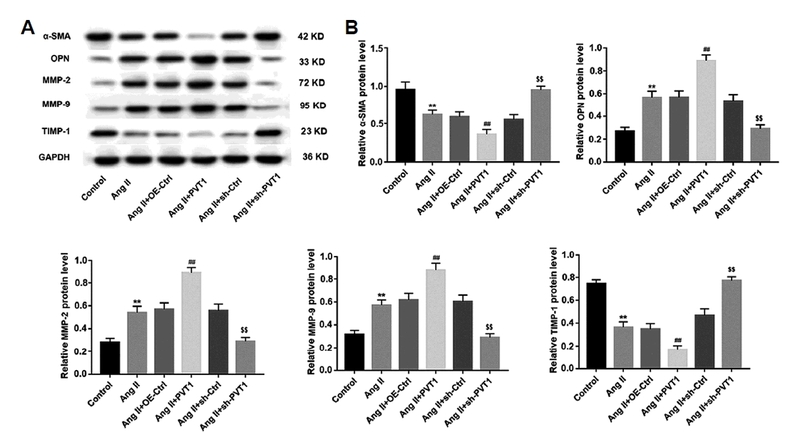 Relative PVT1 expression was significantly upregulated in the abdominal aortas from Ang II-treated mice at days 14 and 28 compared with mice that received an equal volume of NS. N = 5 for each time point. *P < 0.05, **P < 0.01 vs. NS group. AAA: abdominal aortic aneurysm; NS: normal saline; Ang II: Angiotensin II; ApoE−/−: apolipoprotein E-deficient. 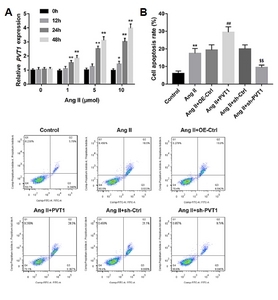 (A) Relative PVT1 expression was detected by qRT-PCR in cultured mouse primary VSMCs that were stimulated with different concentrations of Ang II (0, 1, 5, and 10 μM) at various time points (0, 12, 24, and 48 h). *P < 0.05, **P < 0.01 vs. 0 h group. The cultured VSMCs were then induced with Ang II (10 μM, 48 h) alone or transfected with the indicated vectors. (B) The apoptosis rate of cultured VSMCs was examined by flow cytometry. A representative flow cytometry plot of cultured VSMCs from each group is shown. **P < 0.01 vs. control group, ##P < 0.01 vs. Ang II+OE-Ctrl group, $$P < 0.01 vs. Ang II+sh-Ctrl group. 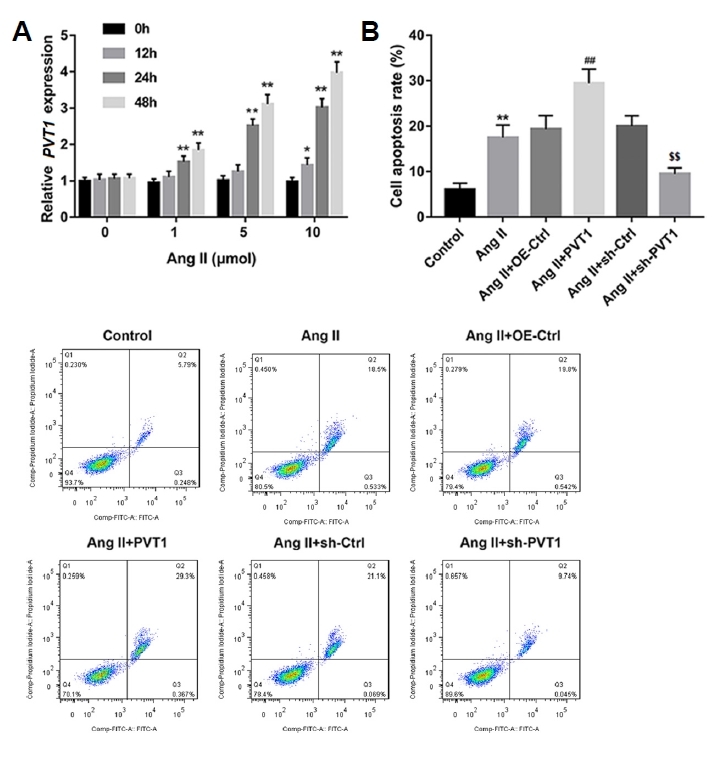 Ang II: Angiotensin II; OE-Ctrl: overexpression control; PVT1: PVT1 overexpression. 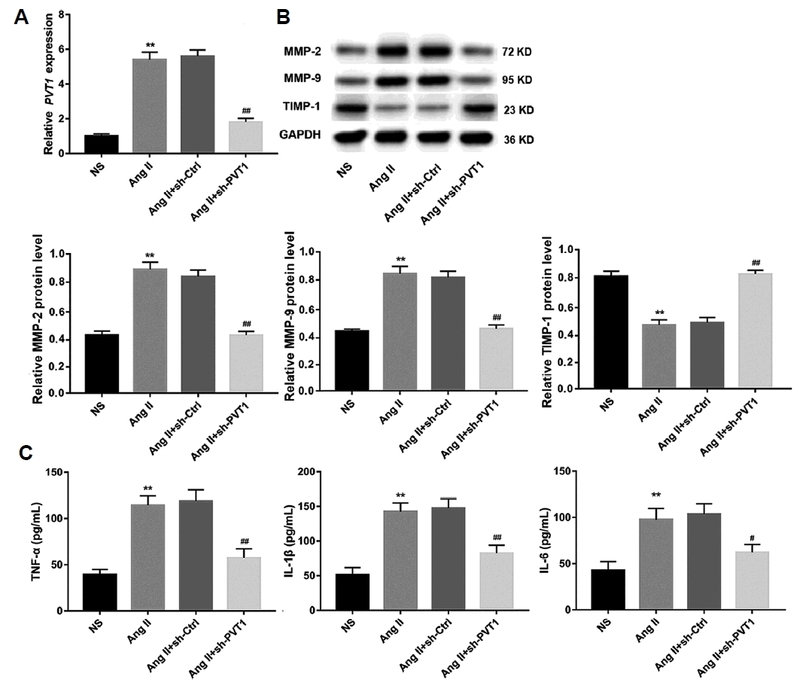 (A) The protein levels of α-SMA, OPN, MMP-2, MMP-9, and TIMP-1 in cultured VSMCs in each group were examined by Western blot. GAPDH served as the loading control. (B) Quantification for all Western blots. **P < 0.01 vs. control group, ##P <0.01 vs. Ang II+OE-Ctrl group, $$P < 0.01 vs. Ang II+sh-Ctrl group. Ang II: Angiotensin II; OE-Ctrl: overexpression control; PVT1: PVT1 overexpression; α-SMA: α-smooth muscle actin; OPN: osteopontin; MMP-2: matrix metalloproteinase-2; MMP-9: matrix metalloproteinase-9; TIMP-1: tissue inhibitors of metalloproteinase-1. (A) Male ApoE−/− mice were randomly divided into four groups: NS, Ang II, Ang II + sh-Ctrl, and Ang II + sh-PVT1 groups. At days 0, 7, 14, 21, and 28 post-Ang II infusion, B-mode ultrasound imaging was conducted to measure the maximal external diameter of the abdominal aorta of the mice in each group. n=15 in each group. (B) Paraffin-embedded sections of abdominal aortas were stained with HE and EVG to evaluate the changes in aortic tissue structure and the damage of arterial wall elastic fibres, respectively. (C) TUNEL staining was performed to assess aortic cell apoptosis. The TUNEL-positive (brown) cells were counted in 10 randomly selected high-power fields, and the apoptosis index was calculated. (D) Representative images of immunohistochemical staining for MMP-2 and MMP-9 in each group. Scale bar: 20 μm. n=15 for each group. **P < 0.01 vs. NS group, and #P < 0.05, ##P < 0.01 vs. Ang II+sh-Ctrl group. NS: normal saline; Ang II: Angiotensin II; HE: haematoxylin and eosin; EVG: Elastica van Gieson; TUNEL: terminal deoxynucleotidyl transferase dUTP nick end labelling; MMP-2: matrix metalloproteinase-2; MMP-9: matrix metalloproteinase-9. 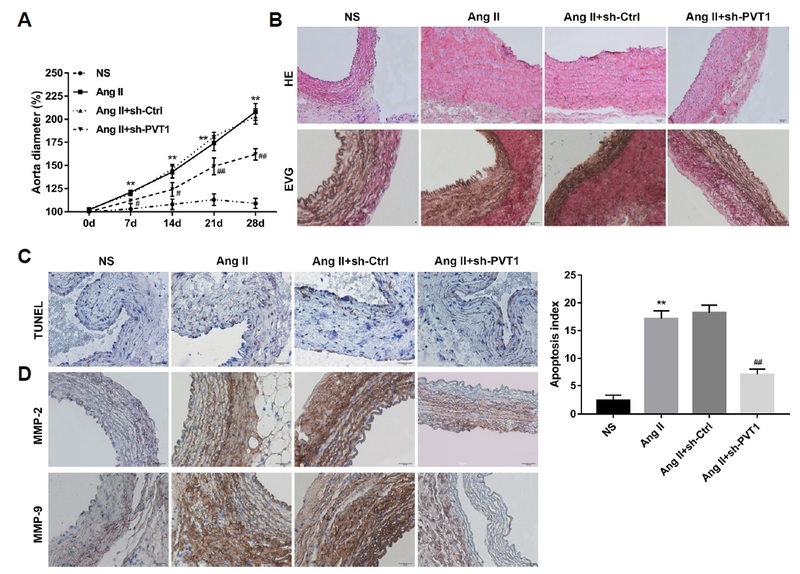 (A) Relative PVT1 expression in aortic tissues from mice four weeks after Ang II infusion in each group was examined by qRT-PCR. (B) The protein levels of MMP-2, MMP-9, and TIMP-1 in aortic tissues from mice four weeks after Ang II were examined by Western blot. GAPDH served as the loading control. (C) Four weeks after Ang II infusion, serum levels of the inflammatory cytokines TNF-α, IL-1β, and IL-6 were quantified using ELISA kits. n=15 for each group. **P < 0.01 vs. NS group, and ##P < 0.01 vs. Ang II+sh-Ctrl group. NS: normal saline; Ang II: Angiotensin II; MMP-2: matrix metalloproteinase-2; MMP-9: matrix metalloproteinase-9; TIMP-1: tissue inhibitors of metalloproteinase-1; TNF-α: tumour necrosis factor-α; IL-1β: interleukin-1β; IL-6: interleukin-6.